BQGB(Berkeley Quantitative Genome Browser) duplicates much of the annotation display functionality typical of a genome browser but with an emphasis on custom and quantitative data such as that produced in high throughput sequencing and genome-wide association studies. 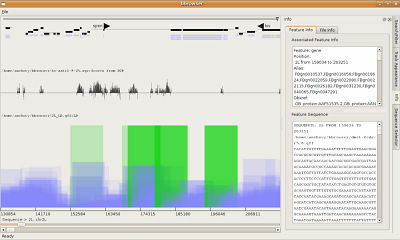 The application runs locally on a user's desktop or laptop computer, avoiding the slow back-and-forth of web based genome browsers. BQGB expects data files to be local to the application process and in a file format such as GFF, BED, SGR, WIG, FASTA or any column delimited format that provides sequence and base pair position locations. This topography should generally be faster than that of a central remote database plus web based browser when working with many custom files, ie. downloading a single reference annotation to one's local machine is quicker than uploading hundreds of custom data files to a remote server!